Ali Taylor started climbing in June 1989 after a school inset day in the Peak District at Whitehall Outdoor Centre. The instructor that day was inspirational and she was immediately hooked. She cut her teeth on local grit stone crags, mastering the easy grades, teaching herself to trad lead climb with an occasional bit of soloing but soon met her climbing partner of 13 years. Already an experienced climber Malc showed her the ropes and they climbed all over the UK, and Spain, France, Luxembourg and North America. Climbing abroad always gave a fabulous variety of rock types and dimensions as well as endless new climbs. Ali always particularly enjoyed the multi-pitch routes that took all day to complete. Red pointing in the Peak District became a way of life for Ali, who took great delight in adding 7b and 7b+ to her climbing repertoire, and she became incredibly strong, but red pointing didn’t inspire the same thrill and enjoyment as trad climbing. As the Milennium arrived Ali returned to her trad roots climbing with different partners and on more adventurous cliffs: multi-pitch, sea cliffs and mountain crags. Venues included Wintours Leap in the Wye valley and Lech Ddu in North Wales. The desire to climb challenging routes led to climbs in Riglos, Northern Spain, the Penon on the southeast coast of Spain, Sardinia where the scope for climbing is wild, everything from trad to 30 foot run outs on sport routes, new routing on the Italian side of the Mont Blanc range and Morocco. Ali now has a more varied climbing lifestyle which takes her sport climbing in Spain, Greece, Turkey and Sardinia, as well as Portland in the UK, trad climbing in Lundy, Morocco, Swanage, Pembrokeshire, North Wales, the Lake District and the Peak District. Ali is just as happy guiding clients, teaching sport and trad lead courses and watching novices become as addicted to the beautiful sport of climbing as she is. 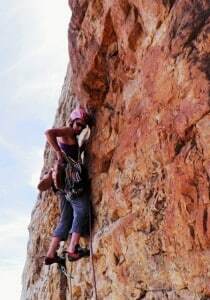 Ali is an enthusiastic climbing instructor with great empathy for her clients. She holds the Mountain Instructor Award, and a Bachelor of Education Degree. She is also an Accredited Assessor and Trainer for Bronze, Silver and Gold DofE. One of the best things about my job is meeting new people. I pick up on their enthusiasm for climbing and love teaching people how to climb safely in the outdoors. Making sure that my clients have a great day out learning how to climb in a safe, ethical manner is my number one priority, but more than anything I would like to think I inspire people to realize their potential.